World MasterCard is the ultimate in credit cards worldwide; it sits on top of the credit cards pyramid. World MasterCard was first introduced to the Egyptian market by Bank Audi empowered with a generous bundle of facilities, benefits, and services. 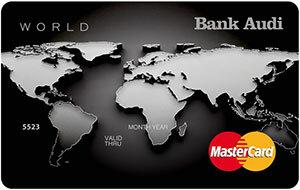 World MasterCard is specially designed for affluent customers who expect the highest level of prestige and distinction. World Privileged Access Program gives you special offers worldwide. Free membership in LoungeKey service which provides you with free access to over 800 airport business lounges worldwide and other travellers can be invited based on the lounge policy. With a maximum withdrawal amount of USD 5,000 monthly outside Egypt.